Album Review: David Bowie, Blackstar – music waffle. What a shock on Monday morning to wake to the news of the passing of David Bowie. His health had clearly not been at full strength since his disappearance from public life following a heart attack, but still, 69 years seems an inadequate life stretch these days. I don’t want to turn this review in to an obituary, and indeed I haven’t the knowledge to do so as (guilty confession here) it’s taken me until the 27th album to listen to a David Bowie long player. Of course I was aware of all the favourites like Under Pressure and Ashes To Ashes, but I guess I thought he was frankly a bit weird. It seems I’m becoming more of an appreciator of weirdness in my old age, and it’s testament to the appeal of Bowie that he continues to engage a new audience even at this stage. I was intrigued by the Blackstar video released before Christmas. I wanted to find out what the heck it could all be about. In truth, two months later, I’m still trying to unpick the messages and imagery in that video. A dissertation could (and should) be written about it by an extremely geeky muso boffin. He’s a Blackstar, but not a Whitestar, pop star, gangster or film star. Beyond categorisation, you’d say. The follow up video for Lazarus is equally filled with blindfolded, button-eyed twitching. There are clear references to death in these songs. 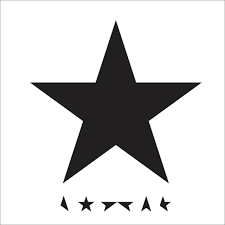 In Blackstar, “Something happened on the day he died, Spirit rose a metre then stepped aside.” In Lazarus, “Look up here I’m in heaven, I’ve got scars that can’t be seen … Oh I’ll be free, just like that bluebird.” The man knew what was coming. One of the most poignant sounds on the track is at the start of “Tis A Pity She Was A Whore” where we can hear David catching his breath, two gasps before he starts his vocal, “Man she punched me like a dude.” Quite what the effect of this was meant to be is unclear, but in hindsight hearing this breathlessness is quite moving. The track Sue, the most guitar driven on the album, tells the tale of an entire marriage in 3 minutes, a false one at that, “You went with that clown.” Girl Loves Me is simply wonderful. We have a yelping Bowie crying, “Where the f*ck did Monday go?” between a complete nonsense of lyrics such as, “Spatchko at the rozz shop, Split a dead from his deng deng.” Another dissertation on this one please. And throughout the album is the feel of the jazzy saxophonist, one that’s not sticking to the normal melodies, but freestyling through the songs. So Blackstar is a fitting leaving present by Mr Bowie – a conundrum as challenging as Kit Williams book, Masquerade, was to me as a child. Confusing, baffling, thought provoking. RIP David. What a shame, I was just getting to know you.